Nothing helps me feel more put together while I'm away from home than some perfectly painted nails, and if you're anything like me, you might struggle to leave home for more than a few days without a bottle (or four) of polish in tow. Bringing your own mini mani kit on holiday has plenty of benefits, from being able to change up your look as often as you like, to maintaining good nail and cuticle health while you're away from home. I've got my personal mini mani kit packing down to a fine art and today I'm going to share my essentials with you! Let's get started! This one is non-negotiable! Never underestimate what a good moisturiser can do for your hands and nails. Holidays can be surprisingly tough on your nails - swimming, outdoor activities, or just staying warm by a fireplace can dehydrate your skin and nails fast. Even on a summer holiday, opt for a thick and hydrating hand cream like Neutrogena Norwegian Formula, Burts Bees Almond Milk Hand Cream^ or Bioderma Atoderm Repairing Hand Cream. 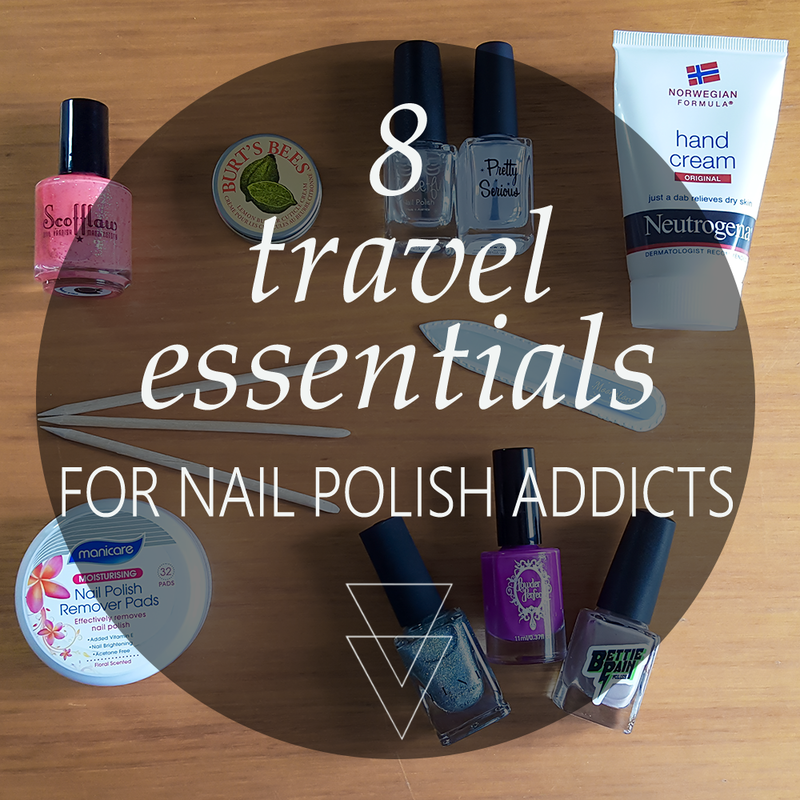 I never leave home without some kind of cuticle product, and neither should you! The number of handbag ready cuticle products has exploded in the past couple years thanks to the rise of indie polish makers offering cuticle balms and oils and they are perfect for on the go hydration for your nails. My all time favourite is Burts Bees Lemon Butter Cuticle Balm^ as my personal preference is balms over oils, but you could also consider Sunny's Body Products cuticle care range or the hugely popular Bliss Kiss Nail Oil. Don't skimp and bring a cheap emery board or clippers. A good quality glass or crystal nail file should be sturdy enough to withstand a bit of travel - I'm yet to break one and I'm queen clumsy! For extra insurance against breakage try GERmanikure, who provide a sleek leather pouch, or a Sephora nail file^ with protective case. You'll only need a few, they won't take up much space, and they can multi-task! Give your cuticles a gentle push after moisturising, use them to cleanup messy application, or use the pointed tip to do a dotticure. Buy them in bulk on Amazon or eBay. Don't even think about a bottle of remover or a scrubby tub. You don't want to risk opening your suitcase to find your belongings covered in stinky, flammable, pure solvent. Wipes are more time consuming and not super effective on glitters, but it's much safer for your luggage. Try Sephora Collection Instant Nail Polish Remover Wipes^ or Manicare Moisturising Nail Polish Remover Pads. A good strengthening or nourishing base coat is your best bet and will help keep your nails in great condition. Obviously you'll want a nice fast drying top coat as well! For base coats I swear by Pretty Serious Rock On!, and Harden Up has a great reputation as well. My current go-to quick dry top coat is Grace-full Nail Polish Angel Glaze but other popular options are Seche Vite, Glisten & Glow HK Girl. We all know that polished toenails are tougher than most brick walls, but if you want to avoid a grown out mess pick at least one colour that you'd rock on your toes. I recently took Scofflaw Pink Elephants on Parade with me for 6 weeks in Europe - perfect for spring/summer! Now is the hard part - picking just a few of your favourite shades to take with you! Ask yourself a few questions before settling on your final selection. How much down time will you have for doing your nails? How long does polish last on you? What kind of events/activities will you be taking part in? Be realistic - you definitely don't need 10 shades for a 2 week trip. Avoid chunky glitters and stick with shades that you know only need one or two coats. Consider taking a vibrant creme, a shimmery neutral, and a seasonal shade of your favourite finish (holo, creme, etc). Finally, if you have one, I highly recommend a super fine glitter like ILNP First Class - it makes for a great last minute touch up to cover worn or chipped tips! Tell me in the comments - what are your travel mani must haves?